Am I at Risk for FTD? If you have a family member who has been diagnosed with FTD it is natural to wonder, “Will I get FTD too?” Thankfully, most cases of FTD (between 60 to 70 percent) are considered “sporadic”–meaning it is a disease that develops in a person by chance rather than a disease that is inherited. When there is no family history of FTD (or other types of dementia or related neurological disease) in a family, it is not likely that others in that family will develop the disease. 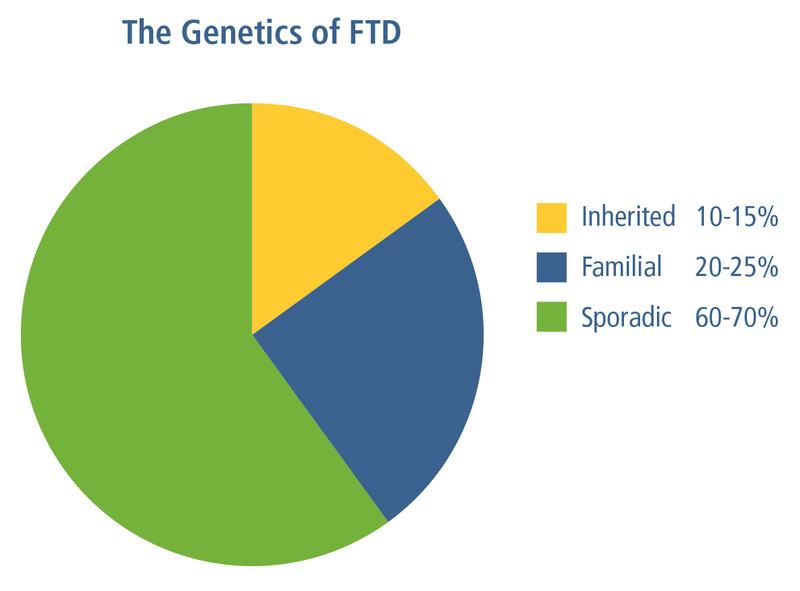 Although having a genetic form of FTD is rare, research to date has revealed that about 10-15 percent of people with FTD have what is called an autosomal dominant pattern of inheritance. This means that there is a specific genetic mutation that can be passed from generation to generation. In families like this, each first degree relative of a person with FTD (e.g., sibling or child) has a 50 percent chance of developing FTD. In an estimated 20-25 percent of cases, a family tree will show other members of the extended family having FTD or another neurodegenerative disease. In families such as these, members may have an increased risk of a neurodegenerative disease, meaning their risk is higher than that of the general population, but not as high as 50%. The best way to begin to determine if your loved one has a genetic form of FTD is to talk to a genetic counselor. This is their area of professional expertise and they will have the most current information available. They will take a careful family history, review available medical records, and arrive at an assessment of risk that can tell you how likely it is that FTD is hereditary in your family. Genetic testing can be done on a person diagnosed with FTD to look for mutations known to be associated with the disease. Finding a mutation can confirm the disease is inherited. Follow this link to Stories and Poems to read an essay by Amy, who has had practice in maintaining perspective about the risk of inheriting FTD from her dad. The Association for Frontotemporal Degeneration (AFTD) has a detailed booklet available called “Understanding The Genetics of FTD” that may be helpful for your family should this be an area of concern.